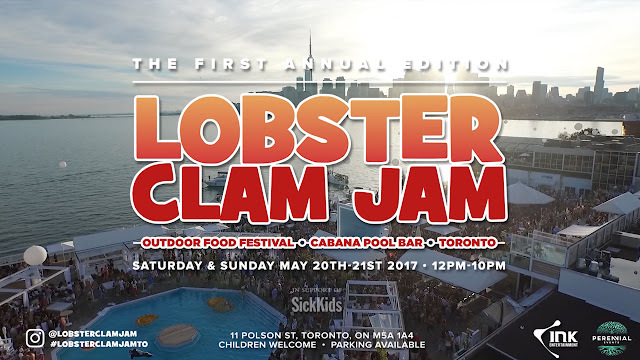 I'm giving away 5 PAIRS of tickets to the first annual Lobster Clam Jam Food Festival taking place on Saturday May 20th & Sunday May 21st at Cabana Pool Bar. Each pair of tickets is worth $50. Lobster Clam Jam (Instagram: @lobsterclamjam, Facebook: Lobster Clam Jam (Toronto)) is a highly acclaimed outdoor food festival. Not just for seafood lovers, this affordable culinary showcase offers guests the opportunity to experience the creations of a variety of renowned local chefs and restaurants. 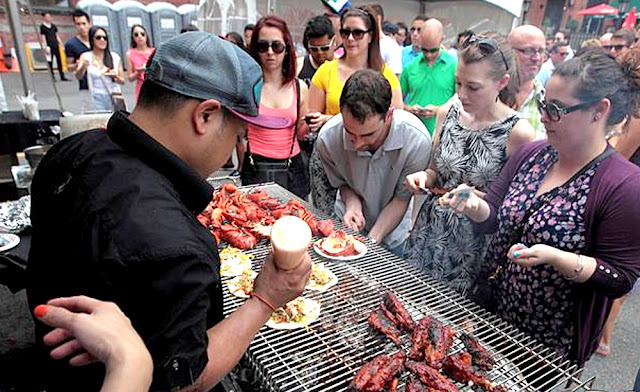 Already a must for fans of Montreal’s world-class food and festival scene for the past four years, and deemed “One of the Top Canadian Food Festivals to Visit This Summer” by Food Network Canada, Lobster Clam Jam will feature delicious creations from well-known restaurants from Toronto and Montreal such as Patria, Weslodge, Oliver & Bonacini, Jae Anthony of Seasoned Dreams, Blowfish, Notre Dame Gourmet, Queue de Cheval Steakhouse and Raw Bar, Buster’s Sea Cove, The Food Dudes, Bac Ky Pho, Buonanotte, Boehmer and Cherry Street Barbeque, plus many more. Guests will be treated to a culinary experience by each restaurant along with a freshly shucked oyster station. 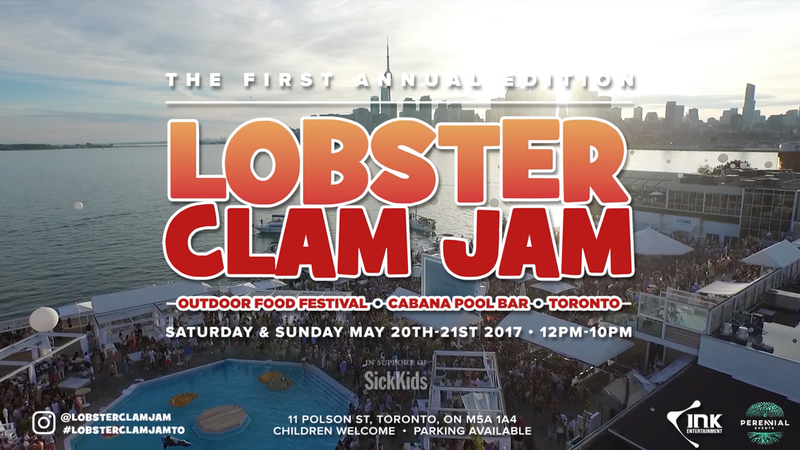 The Festival will also feature their very own signature whole or half lobsters. Mixologists will offer signature flavoured Mojitos, Bloody Caesars as well as a wide assortment of beer, wine and other libations. 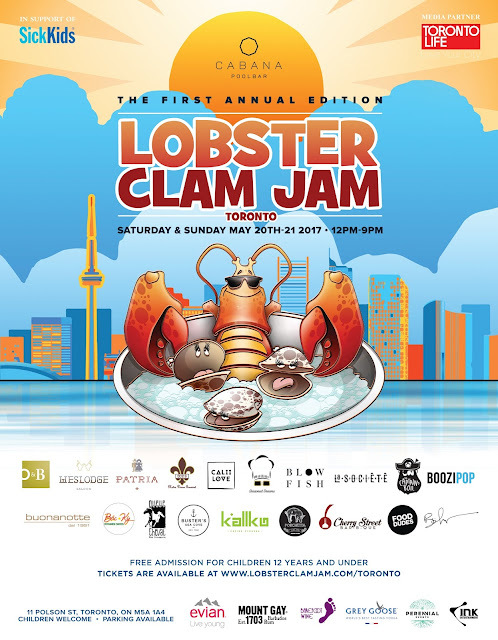 Lobster Clam Jam is a family-friendly event, with a variety of activities for children to enjoy, including bouncy castles, face painting and caricature artists. Free admission for children 12 years of age and under. A portion of the proceeds will be donated to SickKids Foundation. Place: Cabana Pool Bar, 11 Polson Street, Toronto, ON. Prize: Two tickets, each ticket valued at $25. What is included: Your tickets include complimentary entry. Food coins not included. Winners can only redeem for one day. 1. For your entry to be valid, you need to tweet the above sentence exactly as shown. 2. You may tweet once a day for the duration of the contest. Re-tweeting others do NOT count as a valid entry. 3. Contest is tracked by the #fjclcj hashtag. If you don't see your tweet in the hashtag stream it means there is no entry from you. Read this to find out the possible reasons why your tweets are not showing up. Contest starts on Saturday, May 13th, and ends on Thursday, May 18th at 12PM. Five lucky winners will be chosen randomly from www.random.org and I will announce the winner shortly after.